Well, I made a card for a challenge today and couldn't remember the challenge blog where I saw it? Whether I'm too late or not - or even, whether I dreamt it, yes, I'm sad enough to dream about card making too - anywho, it was for a 'cute' challenge. But no matter because all the stuff I used for it only arrived saturday, so I was also going to enter it in Darnell's NBUS #4 Challenge too . . . so now it will be exclusive over there. 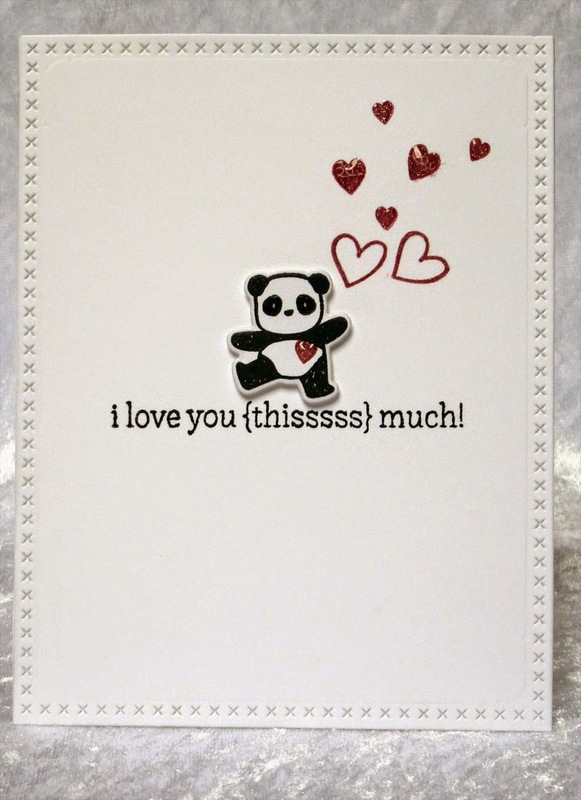 This is the card, almost a one layer - except for the foam mounted panda! 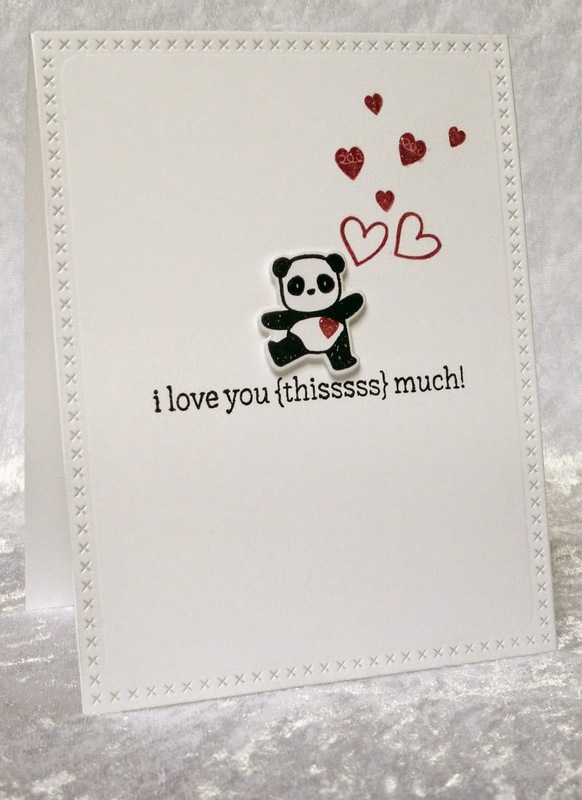 Such a simple an cute card...love it! You made me laugh because I have had those days where I made a card and could not remember wher to post it!! 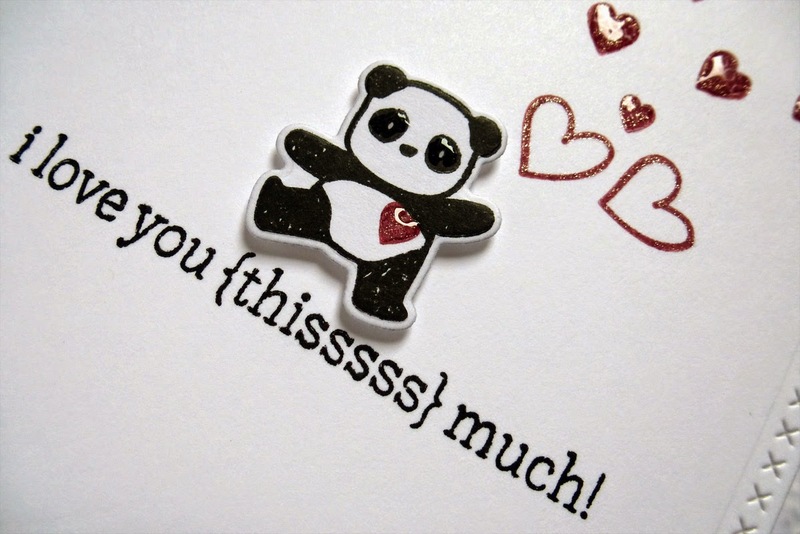 I love this little panda throwing hearts. You do clean and simple so well!! I also enjoyed your posts from the stretch your dies classes. Great job. You poor thing!! I think we've all been there (well,I certainly have....). Trying to find something you've seen on blogland can be a nightmare and you do feel like you imagined the whole thing. Glad Lynne told you about Addicted to CAS, so your not losing your mind!!! 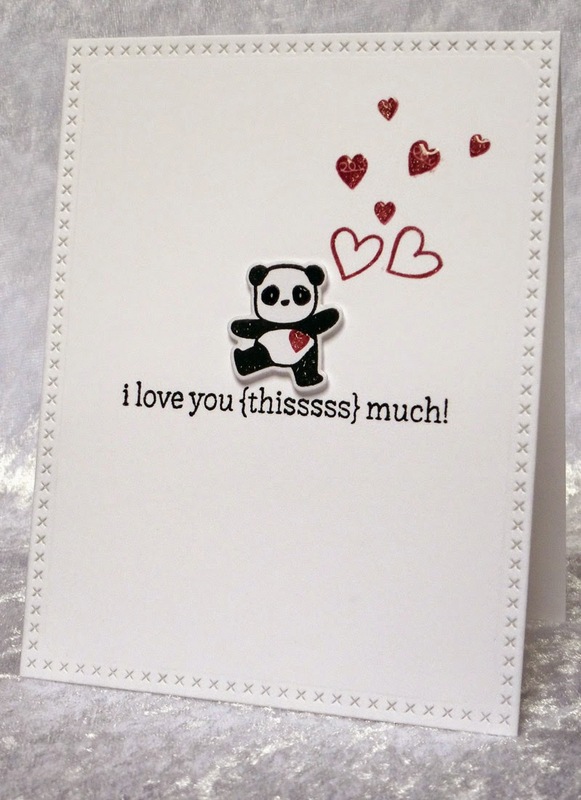 Simply cute card, just love that panda and the subtle stitching frame is brilliant! Hazel, you are not alone! The same problem: always I forgot which challenges are current online and where I want to take part. My Computer is't in my craft-room (not even on the same floor of the house!) so I needed a non-computer-solution to manage it! A small (Din A5) college block and some small colored post-it-papers at the edges to mark important things - that's all you need! And a great secondary effect is: you have a little guide in your hand where to can get inspirations to a special theme or technique - from all the closed challenges. This really is a "cute" card...very nicely done! Oh, Hazel, this is the very definition of CUTE! I don't see it here, but I do hope you made it in the ATCAS "cute" challenge! I just got those sweet cross-stitch dies and love how it looks with your sweet panda! This is one for the to-CASE folder! !